I recently attended a meeting of a large, well-known job-seekers group. The topic was how to answer that dreaded Salary Question. The advice given by the group’s leader focused on a philosophy that has been heard for years. Basically, he told the group to try to not answer the salary question at all, using any of several tactics (like the examples described above) designed to avoid revealing your prior salary or stating exactly what salary you are looking for. He framed it as an adversarial negotiating game, much like Poker, and actually said: “The first person who says a number loses.” While that philosophy may have value (many people have used it very successfully over the years) I feel it is rather “old school.” Times have changed, and in today’s candidate-flooded market, new approaches need to be considered. At a recent HR Panel Discussion at that same job-seekers group, the panel – consisting of HR professionals from three Fortune 500 Companies – was asked how they reacted when encountering candidates who avoided the salary question, or simply refused to reveal their salary history and/or articulate their salary needs. The answer was unanimous: they all said: “next candidate!” In other words, if a candidate didn’t answer the salary question directly, they would immediately be eliminated from consideration at those companies. There were simply too many qualified applicants for every opening for them to want to deal with someone who couldn’t give them that basic information. Now, is that true of every company? Probably not … I would imagine that smaller companies would be less likely to react so quickly and harshly. If you are dealing directly with a smaller company’s owner or hiring manager, you might find a more forgiving attitude. But certainly this is a huge cause for concern among job-seekers. If directly asked what your prior salary history was by a company representative – I say answer the question! Don’t ever lie or exaggerate. (The truth will always come back to bite you!) If the question is part of an online application, you sometimes have the choice of leaving those fields blank (or putting “$1.00,” saying “Negotiable,” etc.) That might work sometimes … but may also be a reason for whoever reviews your application to simply pass on you without ever telling you why. I know … you don’t want your history to “pigeon-hole” you into a low number that is below what you want or need. But there is a risk associated with either way of dealing with it. The bottom line is the same as the answer to #1 above: If there is a large disconnect between a person’s prior salary history and the range a company has defined for a particular job, it is usually a waste of everyone’s time to pursue that match. Sooner or later, you’ll have to reveal your salary history – it’s inevitable. If that information ends up being perceived as a red flag for the company, they’ll want to know up front … not after spending a lot of time with you on phone or inviting you in for face-to-face interviews. This is probably the toughest question to deal with. Again, I say answer the question! However, give a range – a span anywhere between a $5 and 15K spread is typical – rather than a specific number. It always helps if you know the range that the company has defined for the job you are applying to. Whenever possible, try to get that information beforehand. Barring that, use your common sense, do some research, and try to guess the range based on industry knowledge. The bottom line is: you should know in your mind what number is at the bottom of your acceptable range – the number below which you wouldn’t even consider accepting a job. It’s what you need to pay your bills. The bottom of your stated range should never be below that number. It could be a bit higher, but should also jive with your salary history. (If you are currently working, that low number would logically be slightly higher than your current salary — but not so much higher that you seem greedy. 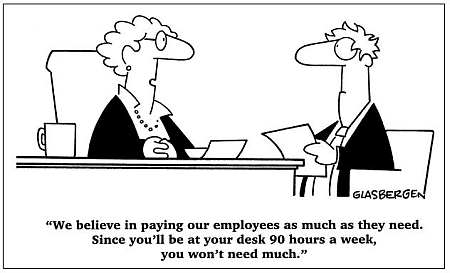 Most potential new employers would expect you to prove yourself before they’ll just hand you a “raise” from day one!) Don’t assume that the lower number you give is the one they’ll focus on and offer you. Most companies will want to pay people somewhere in the middle of both your and their range, and won’t simply low-ball you if they truly want you. If your “middle” and their “middle” overlap, then you’ve hit their sweet spot! Another strategy that works well when asked “What salary are you looking for?” is to turn the question around and say: “I’d be happy to answer that question … but before I do, can you give me an idea of the salary range that you have budgeted for this position?” Then just wait for an answer! If they won’t reveal that information first, then simply give your range and then immediately ask: “Does that range match what you had in mind for this position?” You will most likely get a good idea right then and there if you’ve hit that “sweet spot” or not. Most companies also balk at hiring people at a salary that is significantly higher than their prior salary history suggests. I’m sure there will be heated disagreements on this one, and I’m also sure there are stories out there from people who have made huge jumps in salary that will seem to disprove this – but those are rare exceptions. This is the way most companies (especially the larger ones) behave – like it or not. Based on my many years of experience, and discussions I’ve had with many knowledgeable colleagues in both staffing and HR, I can state with great certainty that in a candidate-flooded market like the one we are in today, big jumps UP in salary are rare. Lateral moves or jumps DOWN are actually more common – but not so far down that you would be thought of as selling yourself short and be a risk for bolting to a better job when the economy picks up. So, to summarize: I say do not avoid the salary questions. Answer them directly and with as much confidence as you can. You can’t escape from or expect to hide your own salary history. HR people and recruiters will have much more respect for you, and be more willing to engage with you, if you are simply honest with them. Just be prepared to discuss it intelligently, and armed with the best company and industry information you can. If there are extenuating circumstances that explain either why you’ve been underpaid in the past and now desire more, or conversely why you are now willing to take a cut in pay, be prepared to articulate those issues as well. Entry filed under: Advice for Job Seekers. Tags: job-seekers, salary, unemployment. I agree 100%. Many very good qualified candidates that if you avoid to answer they can just go to the next applicant. very good info, thank you very much!! Good comments on the salary question, mostly targeted at getting as much as possible in the offer. Please comment from the other direction that we are seeing in today’s job market. E.g., you are applying for a job that is in a lower salary level than you had because jobs are so few and far between. If you provide your last (high) salary, you could be eliminated for because you are too senior and expensive for the role. Jim: If your prior salary history indicates a level of compensation that is well above the range offered for the job you are applying for, most companies would view that as a red flag. You would have to include a convincing and logical explanation as to why you are willing to take a large cut in pay to avoid being eliminated from consideration. Since each person’s circumstances are unique, it’s difficult to generalize an answer. Some possible explanations might be: changing industries or job roles, going from management to an individual contributor role (by choice), wanting to eliminate travel, or relocating to a less expensive area. Unfortunately, simply being unemployed and willing to take a pay cut to get back to work and pay your bills is NOT an explanation that is likely to overcome the red flag. Your realistic article is greatly appreciated. I recently experience a large corporation stealth layoff targeting higher salaries in order to outsource the work at lower cost. It opened my eyes and I’m actually grateful, as now I can reassemble, from posts such as yours, a much more realistic picture and hopefully also reassemble my career. Thanks for the article on the ‘salary question’. I work with MBA students in Europe. They are from many countries. Any suggestions on how to handle to salary question when their last job was in, say, South America or China where salaries (converted to Euros) look very low compared with European levels? I would add incompetent recruiters who tell you that you can’t do the job based on your resume when you know without a doubt you clearly can do the job. I would also add companies who tell you that they have no openings when common sense tells you that every company has openings because there are people occupying jobs who simply aren’t performing. Man, you hit the nail on the head! 8. Lengthy online applications that must be filled out before you can submit your resume to a job posting. – These are such a pain to get through! 6. Mass “Networking Events.” – I have been to a couple and they are a complete waste of time. 2. Companies who ask for your complete salary history and salary requirements before interviewing you. – I always feel really uncomfortable with this. I also don’t like just giving just anybody my SSN. I have been unemployed for eight months the job search seems like an exercise in futility sometimes. I know this may fall on deaf ears, but it has to be said. 1. Especially in the world of startups, salary can be confidential. In every company I headed operations either the NDAs we signed before joining, or NDAs I instituted, strictly prohibited sharing compensation information with anyone but IRS and your banks. We paid people on the value they provided to us and it is no ones business how we valued them. 2. I have never provided salary history in my life and that never caused a problem. And if a company passed on me due to me not divulging proprietary information, than I really want nothing to do with that kind of company. Life is short to work for unprofessional people. 3. I see more and more real recruiters agree with me on this, if you, as a recruiter, need my salary (or compensation as a partner in my previous venture) to make a judgment on my value, I question your professional skills as a recruiter. Real recruiters I have worked with could not care less about your resume or your “salary history”, they knew the right questions to ask both client and candidate to find the perfect match for the needs of the company. Unfortunately many recruiters are like real estate agents – have no business being in the profession. 4. Lastly, please don’t BS saying you, as a recruiter, work for me (the candidate). I don’t pay your fee, you don’t work for me and don’t expect me to share any confidential information with you. You work for the employer and you will receive as much as it is professionally fit. Yes, market is full of candidates, but I know people of my value and caliber are not that plentiful, therefore we do not need to tolerate unprofessional conduct. 1. Anything is possible in the world of starups. Those are unique circumstances. 2. In larger business world, salary discussion/disclosure is a normal part of the hiring process and not view as out of bounds. It seems silly to miss out on job opportunities because you feel salary history is somehow “proprietary” information. 3. I agree with you to a point. Good recruiters will know the going “price” for certain professionals and will be able to match candidates and companies primarily on other factors. However, salary history is part of the equation. One example, it plays into the candidate’s expectations and his/her perceived value – which will affect his/her initial interest in a given position and long term fit. 4. True, I work for my client’s interest first but that doesn’t mean I am not also working for my candidate equally as hard. These are not mutually exclusive aims. I am always looking for win/win/win situations. While there are some shady and unprofessional recruiters out there I have encountered very few in real life. It is great to have a rare and valuable expertise/skill set, but at the end of the day the employers set the rules and there are always other candidates. Naturally, it would be easier for recruiters and HR folks if every candidate gives them salary and history, so that they can shop for the relatively cheapest candidate. So if, as a candidate, your major selling point for the job is that you’ll work for peanuts then say it loud, say it proud! That’s your opener. What’s overlooked in this discussion is that it’s just as easy, and more logical, for the employer to provide the salary range for the position. Before hiring a candidate a manager must justify the need and estimate the cost to fill it. So the company already knows the salary range, if it matters to them. Secondly, it makes much more sense for the company to provide the salary range for a position since the salary is directly related to the work expected, experience necessary and hours for the position. The salary for this position has little or nothing to do with any previous positions I’ve held. Thirdly, the company should be able to set a more accurate “price” for the position than I can. I’ve only looked for, say ten jobs in my life. They hire dozens to hundreds of people and have the resources to properly set a reasonable price. I’m an amateur. I can see two reasons for asking the candidate his salary. One – eliminate people who are out of the ballpark. Of course if the company outs their salary range, that gives the employee a chance to quickly re-evaluate his opinion of his worth before opting out. Two – to take advantage of the inequity of information that some candidates have of their value in the workplace. As a candidate I’ve worked with some companies that don’t turn the salary question into a game of chicken and I’m happy to tell them what salary I’m looking for (history, never). Companies that make a big deal out of it are almost always looking to screw the candidate. Every job is a two-way street. A company is not much more than a bunch of employees. Intellectual property is of no value without employees to sell it, make it, deliver it and improve it. I’ve worked multiple Fortune 100 jobs. On average they ain’t nuthin’ special. Many rich companies are rich because they pinch pennies including on everyone, especially their low to mid-level employees. I agree with John Craig, lack of follow up from the potential employer is very frustrating. I agree that the research is a big deal. You can check industry standards, but also where you expect to live. You can cite your experience, but if you’re asking for something 50% than their range it’ll be a tough sell. A follow-up I have is: how do you get the salary information for the applied job up front from the company? Excellent post. I’ve spent some time with a career coach who must be “old school” on the dreaded question “How much did you make/how much do you hope to make?” I found it interesting that recruiters were put off by an evasive answer when, more often than not, they’re unwilling to be upfront about the salary range on a posted job. What’s good for the goose should be good for the gander. Any tips on getting them to give an applicant some idea of the salary before both parties spend hours filling out forms and interviewing? There’s a company here in Nashville who spent 3 hours interviewing a friend of mine (who is 6-figure material) only to be offered a $23,000 position at the end of the process. That’s insane. I came across your LinkedIn profile on one of the groups we share. I totally agree with you. Negotiating for a job while hiding current salary could result in total waste of time if you are making more than what the company could offer you. So I guess the best strategy (most of the time) would be to reveal the current salary. By the way, you have written excellent blog posts which are filled with wisdom! Please keep blogging; I am looking forward to other blog posts of yours. Nice work, as usual, Michael! Thank you for the informative blog. I found this article particularly useful. But what about a case where someone’s previous salary is well below the average range for the position? For example when switching into a larger firm in a generally higher-paying industry. Is there a way to justify a 50-60% salary increase? Could you recommend a way to handle such a situation? Especially when dealing with a 3rd party recruiter, whose compensation may be based on the candidate’s offer. As I said at the end of this blog article, when there are extenuating circumstances that explain why you’ve been underpaid in the past and you now desire more, just be prepared to articulate those issues. It’s not an easy task to convince someone that you are worth more than you’ve been paid in the past – especially if, as you said, you are dealing with a 3rd party recruiter and not the company itself. Of course, it’s in a recruiter’s best interest to get you more money – not less – since their commissions are based off of a percentage of your salary. However, in the end it’s not up to the recruiter. It’s their client company that determines what range is budgeted for the position and ultimately what the offer will be. A convincing and logical explanation of your circumstances is your only hope. All you can do is try, using your best research and market information. And you also have to be realistic, and decide beforehand what your true bottom line is … and be prepared to walk away if they can’t meet your minimum. This is really cool and useful information. It’s great that you simply shared this with us. Thank you for your generosity. Does anyone have advice for someone who is slightly above entry level but doesn’t have a salary history? I served in the Peace Corps and just completed a Master’s degree, but I have never had a salaried job in my field. How would you approach the salary question? Since your job history was all non-salaried, my advice would be to research the typical entry-level salaries in your field. Such information is readily available on various websites like Salary.com, Monster.com, Careerbuilder.com, etc. Once you have an idea of what those typical starting salaries are, you’ll have a better idea of what to ask for when asked what salary range you are looking for during an interview. Just be honest and explain that you are an entry-level candidate, and that you hope to find a growth opportunity with a salary that is competitive within your industry.